It’s hard to know where to start when it comes to the legendary Killing Joke. With a career spanning approximately 37 years, there is much to bounce off and indeed a heck of a lot to compare with, regarding the quality and indeed relevancy of a new album. No worries there, though; as Coleman and crew have produced here, some of their mightiest work in years. ‘Pylon’ closes a trilogy of releases, kicked off in 2010, with the mighty ‘Absolute Dissent’; and followed up with the solid ‘MMXII’, which didn’t hit all the marks for me; despite being a fine and solid release as a whole. Safe to say though, this latest album, not only blows both those albums away; it could quite easily rank as one of Killing Joke’s finest moments ever. The key element that resonates throughout this release are Jaz Coleman’s vocals. For the majority, there is less focus on riotous screaming and more emphasis on reverberated and chamber echoing harmonies; that are simply monolithic in proportion. Capitalising on a wealth of experience, Geordie’s guitar work is a sea of Industrialised Post-Punk with a metal ethos, that fires out as a multi-layered glistening beast; as Youth’s bass chugs and grinds and occasionally dips into necessary funk breaks. Paul Ferguson tops this all off as the unbridled rhythmic machine; that punches the musicality of the group, with on point precision and a vigour that we haven’t seen in some time (from many a percussive artist out there). As an album in its entirety, it’s hard to pick out highlights, as it’s all so damn good as a whole. From the beautifully tight opener ‘Autonomous Zone’, the anthemic majesty of ‘Euphoria’ and (personal favourite) ‘Big Buzz’, to the chant of ‘War on Freedom’ and the power chord ridden ‘Dawn of the Hive’; the album seamlessly gels into a compact mix of the rabid and exquisite. For the collector in you, there is many a format to sink your teeth into. It’s unlikely now that many of you will get your hands on the simply stunning 3D lenticular (and double magenta vinyl) gatefold, sleeve as I have; but this does come in standard double vinyl and a double CD. The CD and the limited version of the double vinyl come with the five extra tracks that are on the lenticular version; and are excellent in their own right. So how do I score an album like this? I have always said that nothing is perfect; yet there are a lot of factors I have to take into consideration here. 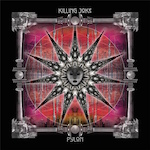 Killing Joke are just as relevant as they have ever been (maybe more so); and have produced an album where each track shines because of the siblings they share the release with. On top of that, there are not many acts out there who will ever muster up something that is as good as this; never mind when they are as old as this bunch. ‘Pylon’ encapsulates that much revered perfection for a variety of reasons; and all of them are unarguable.